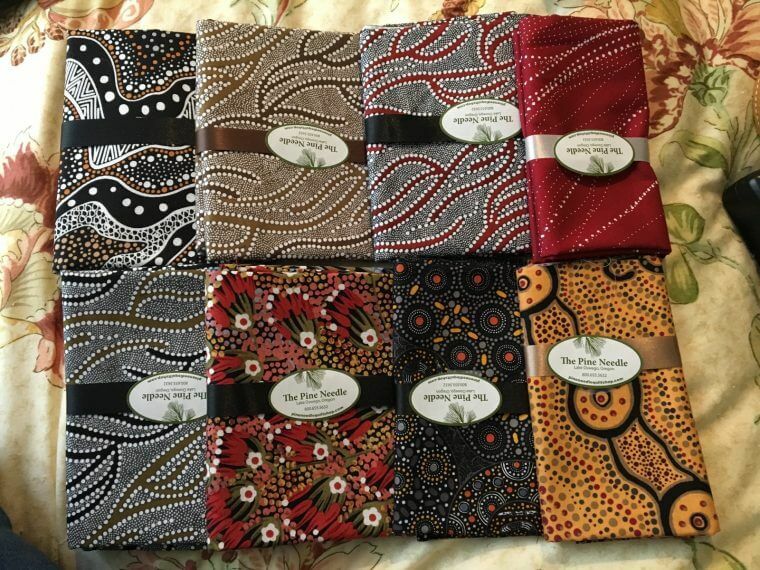 I ran across these Australian fabrics of Aboriginal design and was overwhelmed at how beautiful they were. So I bought a handful of fat quarters and half yards and then tried to figure out what to do with them. I wanted to use them in a wall hanging instead of a tote or pillow, but I couldn’t bring myself to cut them into little pieces. They were just too stunning. 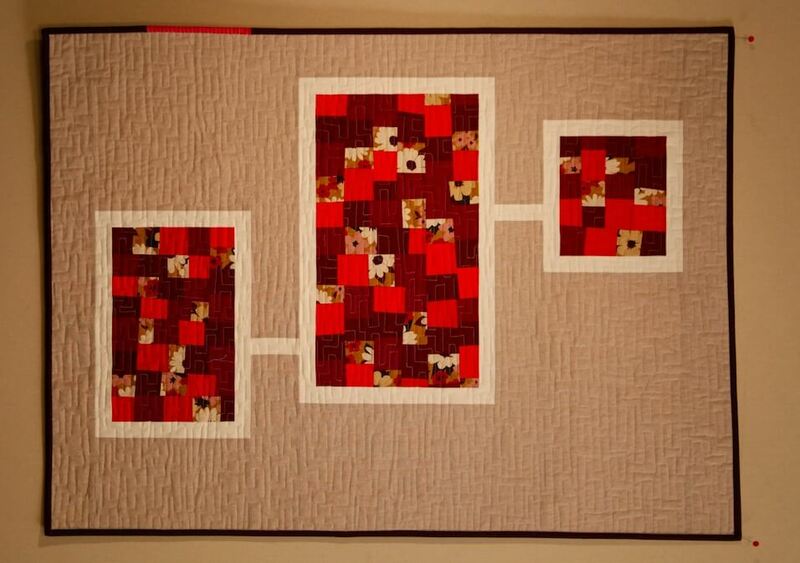 Months later I ran across a quilt made by Elizabeth Hartman and used that as inspiration. 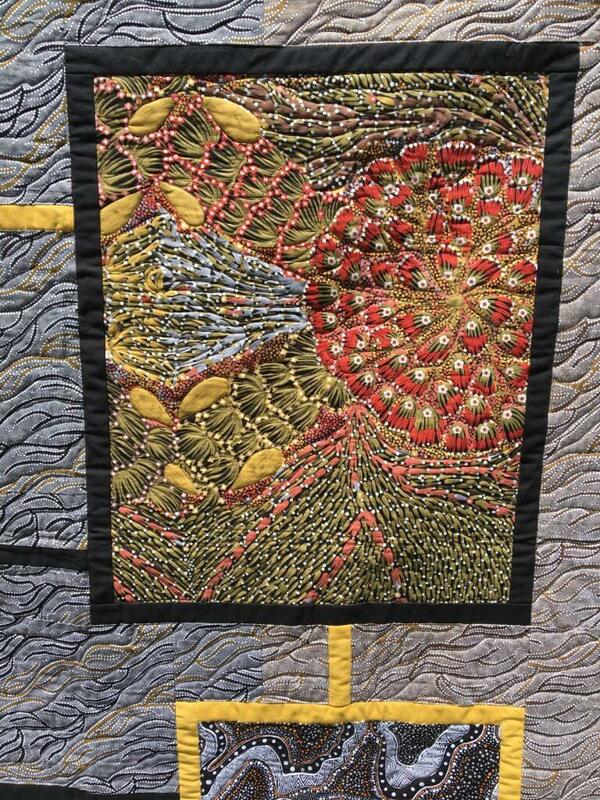 I wanted to use primarily the Australian fabrics with a limited number of solids thrown in only if necessary. 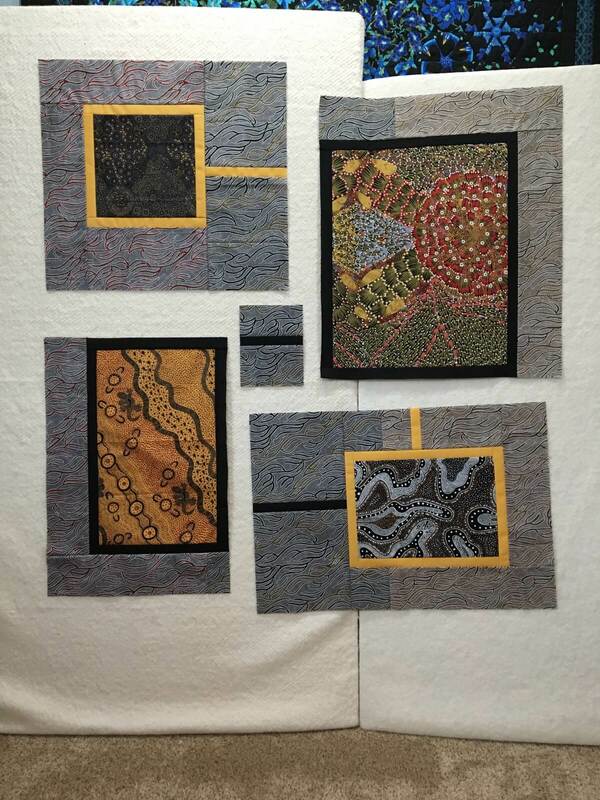 I wanted each of the four “focus” fabrics to have their own highlighted space. I had three different background fabrics, all the same pattern but in different colorways. 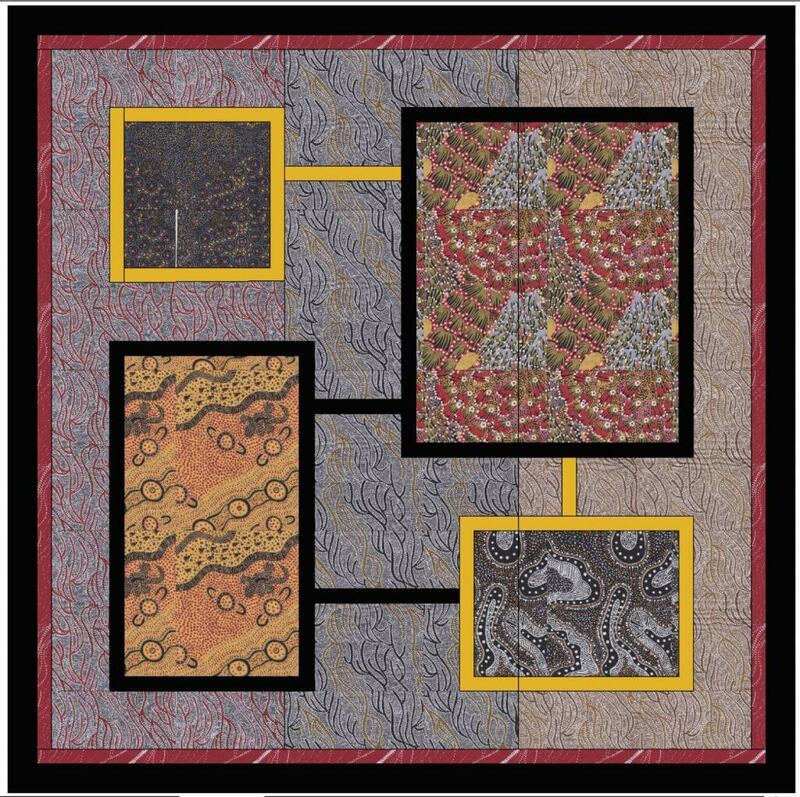 I wanted the background to be equally split into those three fabrics. I was glad I had the software to help me. I scanned in my fabrics and was able to see what the final product would look like, and made many changes during the process. Since the top was made of some large pieces it came together quickly. 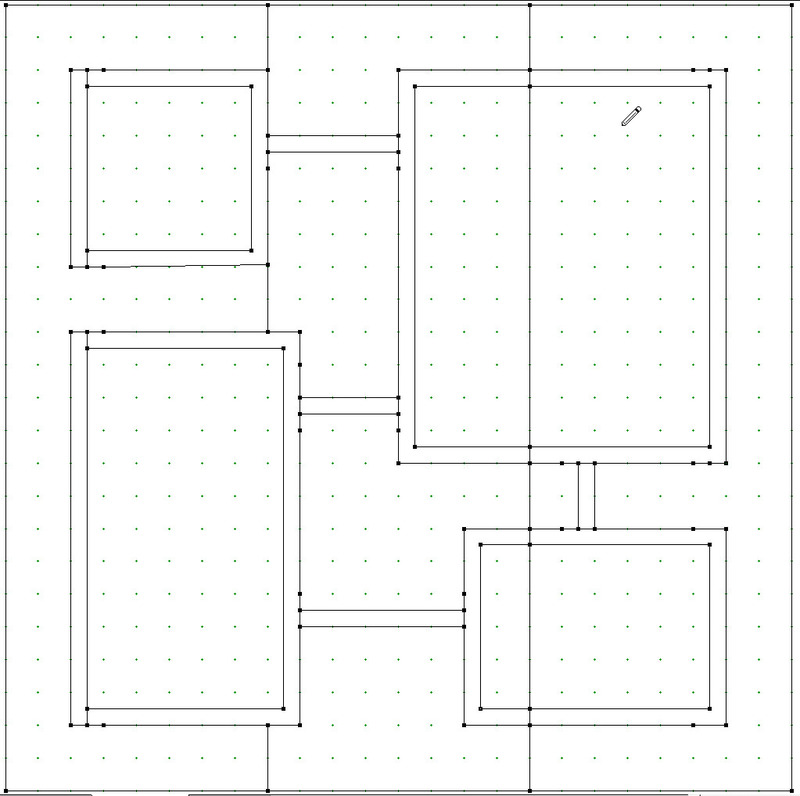 However, I really had to plan ahead to get the pieces put together in the right order. At one point I needed to do a series of partial seams to make it work! For such a simple looking quilt, it was actually harder than I thought it would be. But then the best thing happened. 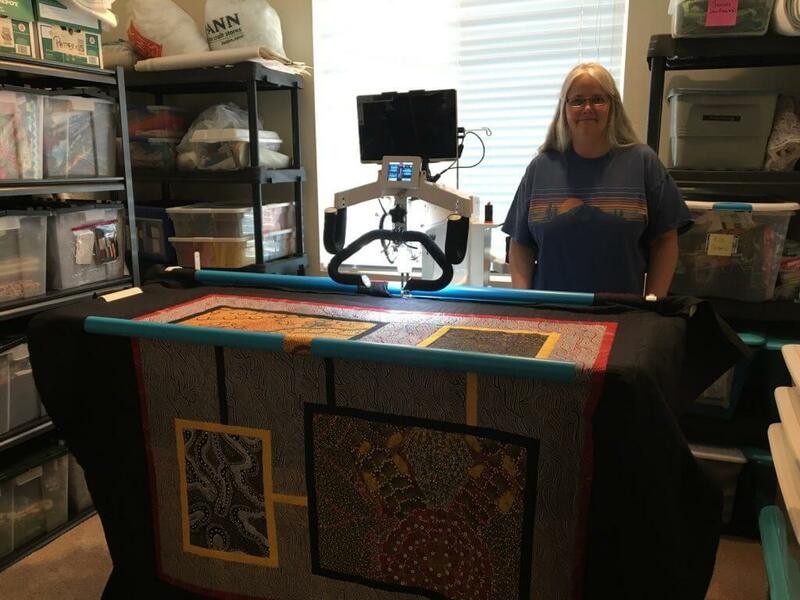 My friend Susan offered to let me use her longarm to do the quilting. OMG! I was excited and petrified all at the same time. 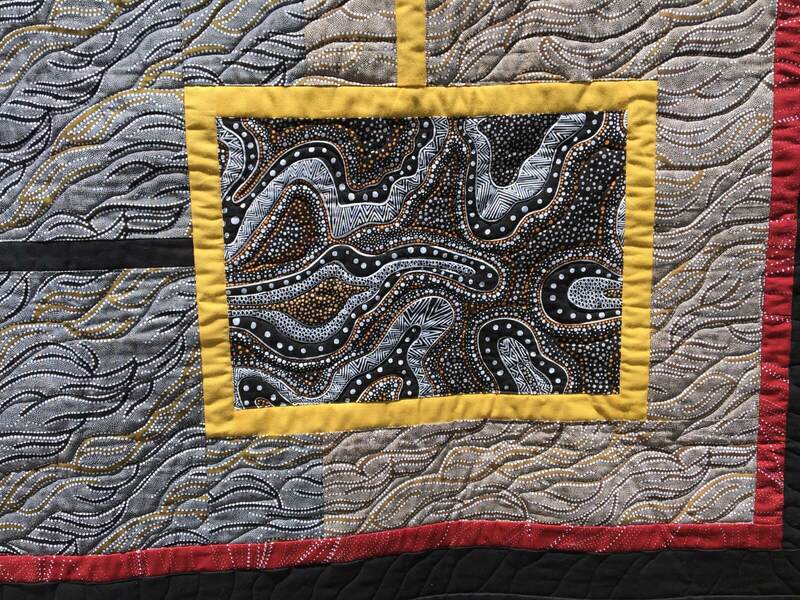 I had always envisioned it being custom quilted, but I had no idea how. 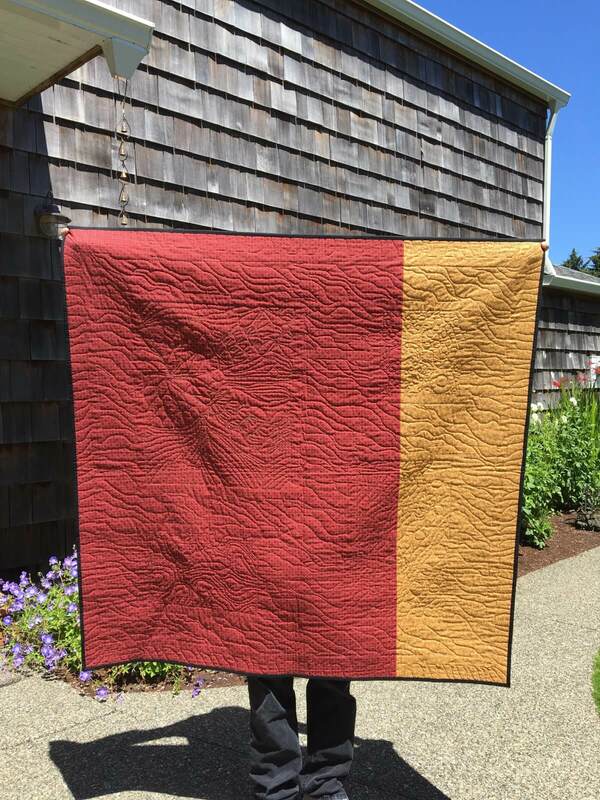 This was a great opportunity because the busy fabric would hide a multitude of quilting sins (which it most certainly did). I went to Susan’s house on three different days for quilting sessions. She got me started and then turned me loose. She even fed me lunch! Thank goodness she was just in the next room working on her own quilting project because I had lots of questions and needed a little bit of handholding. She was really patient and very supportive! 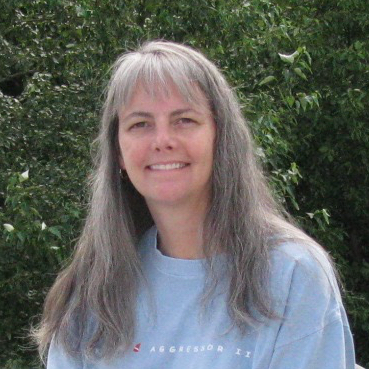 What a wonderful friend! 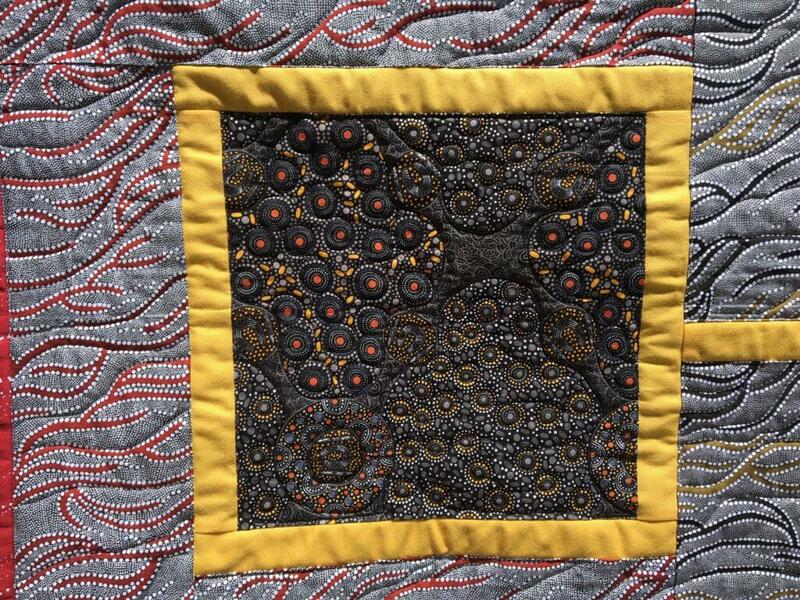 I let the fabric dictate the quilting pattern. I followed the flow of the background fabric and tried to highlight features in the focus fabrics. I had a blast! I think it came out pretty well and now I really want my own longarm. We don’t need a guest room… right? Anyway, this was a momentous project for me. My first time using quilting software to design a quilt and my first time using a longarm to do free motion quilting. I hope to do many more of both in the future! 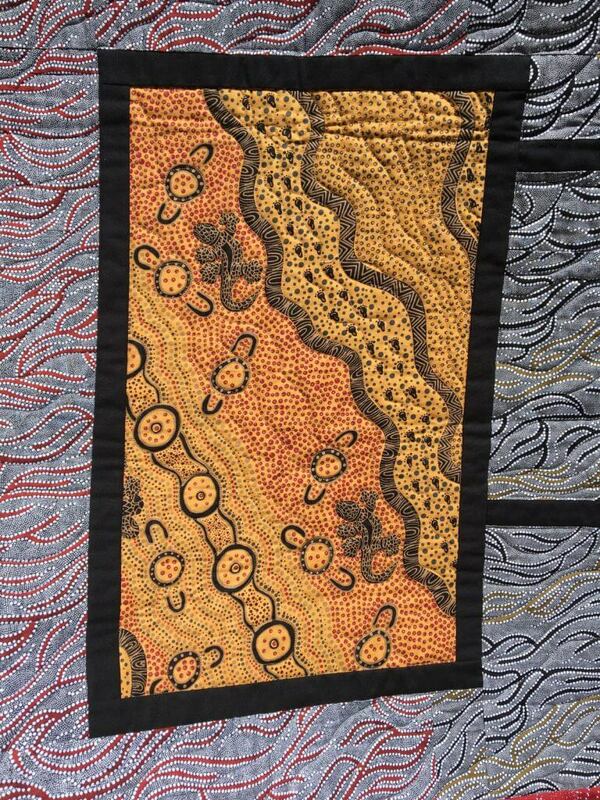 And for sure I will be getting more Aboriginal fabrics. They are amazing! 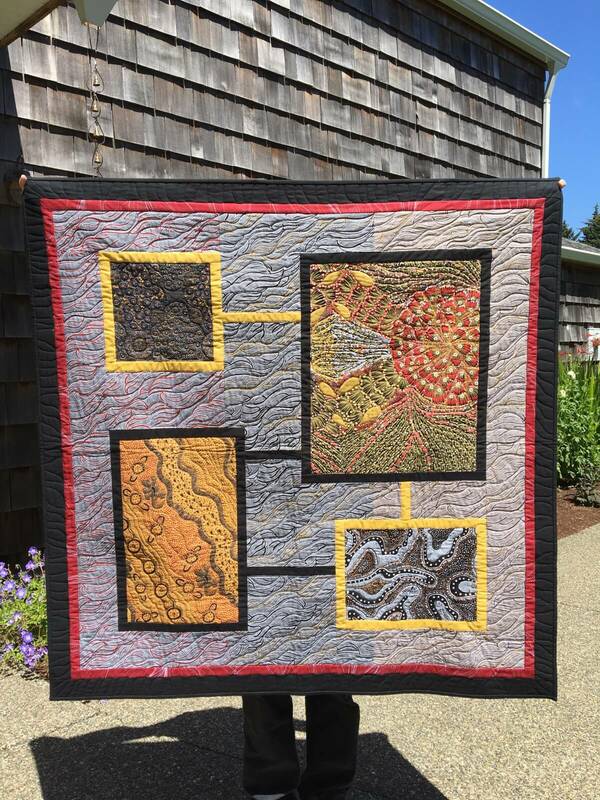 Quilted By: Me – on a longarm! Occasion: First time using a longarm!